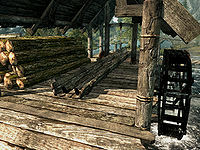 Cutting Lumber is an action that can be performed by NPCs and by you at wood mills. It should not be confused with chopping firewood. In order to activate this animation sequence, you must activate an available "Lumber Pile", which will start the activation sequence of pulling a log down to the center of the mill to be cut. You must then activate a lever on the opposite side of the log to start the cutting process. The log will move forward, passing through a large cutter blade to be split down the middle before dropping down into a pile of cut lumber at the end of the mill. A follower can also be ordered to activate it, but will only do so once each time they are asked. Cutting lumber is only an animation in the original version of the game; the process yields no results. Sawn LogsHF are housebuilding materials added by Hearthfire which are needed for building and furnishing a self-built home. They are hidden, weightless items (ID: xx00300e) which do not show up in your inventory or affect your carry weight. They appear as a "Log Pile" on your property, with the number increasing as more are purchased and decreasing as they are used for building or furnishing a home. If the amount of Sawn Logs in your Log Pile drops to zero, the Log Pile disappears. Buying or sawing more Logs will make the Log Pile show up again. You can purchase lumber from certain mill owners at 200 gold for 20 sawn logs. You can also ask your personal steward to purchase them for the same price, without having to leave your property. Certain lumber merchants will give you permission to cut the lumber for free if their disposition has been raised high enough (value=1: friend). You will cut 10 at one time when cutting it on your own (but see bugs). No matter how you choose to obtain more lumber, it will be delivered to the "Log Pile" on your property at no charge. If you own more than one property, the Log Pile is shared between them - all your lumber can be accessed from any of the three properties. The following table lists lumber mill owners who will sell sawn logs via dialogue. The 'Quest' column indicates guaranteed quests for the lumber merchant in that row which will raise their disposition enough to allow you to cut your own logs for free. You must receive permission via dialogue before activating the mill will yield results. If an entry in the column is blank, there are no guaranteed quests which raise that specific lumber merchant's disposition. However, there are other ways to raise an NPC's disposition, such as certain radiant quests for which the target can be almost any NPC in the game (e.g., Rescue Mission). While some of these quests can still raise a lumber merchant's disposition enough for them to allow you to cut your own lumber for free, they are not listed here because you are not guaranteed to receive a specific NPC as a target for that quest. The Dragon Bridge Lumber Camp is another wood mill which can be used to activate the cutting lumber animation sequence, but you can't purchase lumber there. When building a home with the Hearthfire add-on, your map marker may send you to Half-Moon Mill to buy sawn logs. If Hert is dead, you may go to another wood mill to purchase lumber and clear the objective. When sawing your own logs, the owner of the mill has to be at or approaching the mill, otherwise you will not receive the logs after you saw them. After cutting the lumber and it drops into the lumber pile, you must wait about 10 seconds for the freshly cut log to disappear before it is added as 10 sawn logs. If you want to do something productive while the log is being cut, you can go chop some firewood. The amount of time it takes is approximately the same as the time needed for the lumber mill to reset. The option to saw your own lumber is available, but will not always yield results, even if the lumberjack's disposition is high enough to allow you to cut your own lumber for free. Asking the lumber merchant for permission each time you saw logs at their mill may fix this. 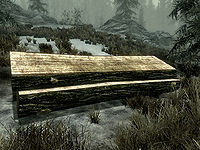 You may occasionally be able to view sawn logs in your inventory. When this happens, they use the model for elven boots. You may occasionally not be able to buy logs from the usual vendors. ? This is due to the needed faction not being set on the vendor (BYOHLumberVendorFaction, ID: xx009ba5). Fix: Go into the console, select the vendor and use addfac xx009ba5. This page was last modified on 7 May 2018, at 13:03.